loodie loodie loodie: Are you a cutter?! To cut or not to cut cuticles? That is the question. This question always seems to divide the MUA nail boards and raises up a storm of answers. I feel like one day we might battle .... the cutter's in one corner, ready to slice em and the non-cutters in the other corner ready to spray with cuticle remover. How can we end this controversy??!! Dare I say it ... I think I have an answer to make both parties happy ... but, it's not a short one. I think there is a lot of misinformation or misunderstanding out there. The bottom line is, the normal person either doesn't know or understand nail anatomy and wrongly identifies the "cuticle". So lets all get on the same page. The graphic below shows some nail parts. We only need to concentrate on a couple terms at the moment. The cuticle is comprised of living and dead tissue. 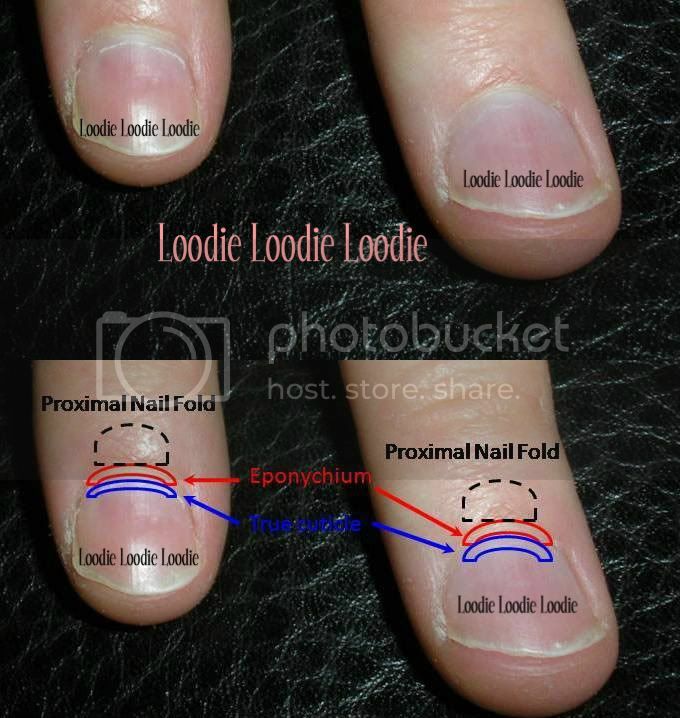 There are two thin skin strips between the nail tip (distal edge) and the proximal nail fold. 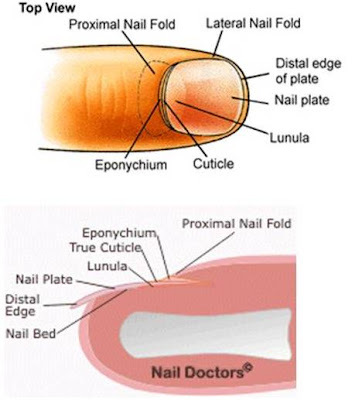 The skin strip closest to the proximal nail fold is called the eponychium and is alive, while the skin that grows on the nail plate is dead and is considered the true cuticle; it is located right underneath the eponychium. So, just to summarize and finally clear the air, when we refer to the cuticle we are referring to the "true cuticle" (dead tissue) and not the "eponychium" (live tissue). Warning: Google image eponychium at your own risk ... it's mega gross! With that said, it is completely safe to remove the dead cuticle (true cuticle). Notice I said "remove" and not cut. You should choose which ever method you are most comfortable with. It's no fun unless we have real pictures of fingers so, lets take a look of what to expect on your own fingers. My husband was nice enough to be provide his nasty fingers for today's viewing. Yes, I said nasty. He won't let me fix them, so the consequence is of course name calling. The top image shows just the fingers and the bottom has all the parts labeled. Look at the finger on the top left, I have slightly pushed back the true cuticle so you can see it (clearly more crusty white). If you look very carefully to the finger on your top right you may just be able to see the true cuticle. The true cuticle can be pushed back all the way to the eponychium, removing it thereafter can be done by trimming or with a cuticle remover. Do your own research online and check out your own fingers. If you are unsure about what is what, go to a reputable manicurist and get a manicure. (I stress reputable!) I am sure they would be willing to show you where your cuticle is since this is what they learned in school. 1. Cutting the true cuticle is fine as long as you are confident in what you are trimming off. 2. Cutting the eponychium (or any live skin) can lead to infection, not to mention ragged cuticles. 3. Not everyone needs to cut their cuticles, this depends on what they have going on down there. Sometimes a cuticle remover is all that is necessary. 3. Simply pushing back the true cuticles would be a good start. AND don't forget to moisturize! I will eventually post how to remove cuticles both by cutting/trimming and with a cuticle remover. Stay tuned! Post about using cuticle remover can be found here. My final words of caution .... Be careful before you start cutting away or you may end up like some of those Google images for eponychium .... gross! The pictures w/ the labels were SO helpful! Good work! It's nice to see your hubby being so nice in borrowing his fingers for your post! my name is kellie and i'm a cutter. :( i can't stop! it's like eating chips. i'm gonna have to stop one day cuz i almost ALWAYS cut myself. sad times. lol, isn't there an eight step programs that involves cuticle remover? "nice enough to be provide his nasty fingers for today's viewing"
Thanks for this post! What do you do about the skin at the distal edge (assuming short nails, I guess)? The skin at either side of the top of my nail bed gets very tough - and I am a long-time hand moisturizer junkie. I thought about trying to use a file to make it softer, like you do for rough skin and calluses on the feet. What do you think? @mena - luckily so did he, what a good sport! @Courtney Graham Hipp - You're welcome :) In my opinion if the skin is so tough that constant moisture (several times a day) over a long period of time (months) does not help, like my feet, I would totally use a file. However, be gentle and careful. Start with a file that has a high grit (maybe ~400) and don't buff off too much because that can make it raw. In another random thought, sometimes instead of using acetone for clean up I file it off, lol. Thanks for your response! Yeah, I am a hand cream junkie and it doesn't do a thing for me as far as my cuticles are concerned. Cuticle remover has helped tremendously around the base of the nail, and I rarely get hangnails anymore. But I need something more aggressive at the my fingertips! I would be happy to forego the acetone and file the polish off - but I have heavily ridged nails and I already seriously damaged my nail plate in an effort to take better care of my nails, lol. Now they're about halfway grown out and peeling like crazy in the damaged area, so I'm keeping them as short as possible (another reason why the skin at my fingertips is so dry). The point being (I had one?) that if I filed off the polish I'm sure I'd screw up my nail bed all over again and I'd probably end up with striped nails! What do you think about peeling off the polish? I've done it a few times and have wondered if I'm also peeling off the top of my nail with it! I think you misunderstood, I don't forgo acetone for total nail polish removal only for "clean up" at the sides on the skin. I didn't mean to suggest that I file polish off the nail, lol, that would be a dangerous game indeed. Have you ever tried cuticle oils or butters? Wow. This is a fantastic article. I've been cutting my cuticles wrong for a LONG time.. woopsie.. Thanks for the knowledge dear! Your great! Excellent post! "Yes, I said nasty. He won't let me fix them, so the consequence is of course name calling." This literally made me laugh out loud. If you were going to fix your husband's nails, where would you start and what would you do? How much could you actually change the way they look? For someone (female) who has nails more like his (wide and flat, uneven shape) what could they expect to accomplish and how long do you think it would take? I just want to have short but even nails with nice round cuticles and a consistent oval shape, rather than ragged uneven cuticles and various trapezoid-shaped nails with differing degrees of white space underneath. Thank you so much for the detailed diagram and clarity. I've always just pushed the cuticles back because I'd been under the misunderstanding that cuticle and eponychium were part of the same thing. Chemical cuticle removers have always hurt, so I've just used some gooey moisturizing thing to soak the area, then pushed the cuticles back. A nice bloody red for the holidays! What's the point of Loodie Loodie Loodie?